Fighters Guild Recruit is a common Agility creature card. It is part of the Core Set. In addition to the card's availability in the Core Set, three copies are included in the Paarthurnax's Roar theme deck, and two copies in the Hlaalu Schemes theme deck. "If I fall, the Hist will reclaim me." 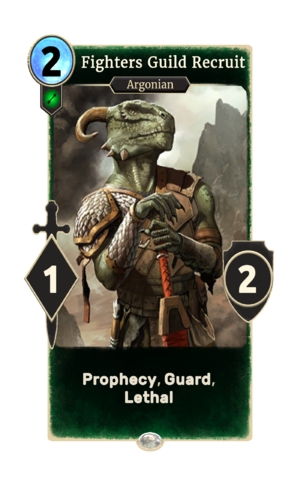 This card was previously part of the training mechanic where it could be upgraded from Guild Recruit at level 6. The card is named for the Fighters Guild. This page was last modified on 15 February 2019, at 13:43.